If you've ever worked in an office you probably know the ubiquitous K-Cup machine, made by Keurig. It quickly and painlessly dispenses single-servings of the hot beverage of your choice. Even, it turns out, if that beverage is 100-proof. 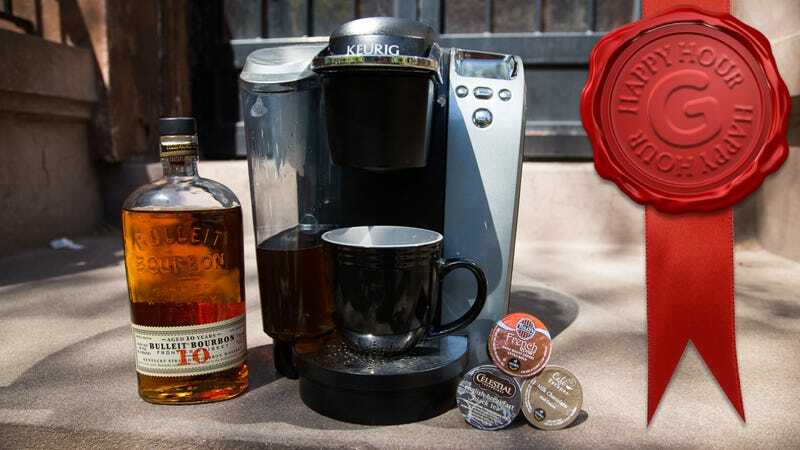 We just happened to have one of these discarded machines lying around, and decided to see what would happen if we used it to make hot, boozy deliciousness instead of boring ol' coffee. Game on. It's Friday afternoon, you've made it through the long week, and it's time for Happy Hour, Gizmodo's weekly booze column. A cocktail shaker full of innovation, science, and alcohol. It's The Jetsons on a bender. Like you didn't know this was coming. 1. K-Cup machines are meant to be filled with water and water only. Using anything else will probably ruin it. 3. You should not put alcohol in a K-Cup machine. 4. If you do put alcohol in a K-Cup machine (which is stupid), make sure you do it in a well-ventilated area, ideally outside, as alcohol vapors are highly combustible. 5. Maybe have a fire extinguisher nearby, too. 6. If you must pour water on the K-Cup machine to extinguish flames, for God's sake unplug it from the wall first. Water + Electricity = Bad. Given all of the above warnings, you may be wondering why we bothered attempting this at all. Because like all great innovators, we were both curious and stupid. While the idea of pouring straight booze into the K-Cup machine and seeing what happened was appealing, we decided this was a bad idea. This machine makes full cups of beverages, and that doesn't allow for much of a balanced flavor profile. If we wanted to make an alcoholic coffee shot, we would have cannibalized a Nespresso machine or something. The idea here is to make something of mixed-drink strength. By substituting alcohol for some of the water, we would be limiting the amount of dilution. And, as we learned in our piece on bitters, alcohol is a very good flavor extractor. We hoped this might get us a bolder-flavored drink. The other reason we add water to the equation is safety. As we've discussed before, when you're lighting a drink on fire, what you're really lighting are the vapors that come off of it, not the fluid itself. Higher-proof spirits produce more vapor than spirits with more water in them. So, by adding water, we are cutting the alcohol by volume (ABV) of the solution. This raises its boiling temperature (pure ethanol boils at around 171 degrees F when at sea level), and decreases the amount of flammable vapor that comes off it, which is especially important when you're exposing it to a heating element. Here's how we made our first successful K-Cup drank. Note: In the video you see a really nice bottle of 10 year old Bulleit bourbon. I promise you we did not use that in this experiment. We are not monsters. We used Jim Beam. The Bulleit bottle was just more photogenic. 1. Pour two parts water to one part whisky into the Keurig's reservoir. Slosh it around gently to mix. We tried it with a 3:1 ratio, but the resulting drinks were too watery. The 2:1 ratio is just right. 3. Insert the K-Cup of your choice, preferably a dark roast (we used one from Tully's) and select the setting for the second smallest cup (6 ounces), then hit Brew. 4. The result should be a hot cup of pre-spiked coffee, which is pretty tasty on its own. However we suggest stirring in a teaspoon of brown sugar, and then adding a splash or two of Irish cream (we used Bailey's) to taste. You can also use whipped cream, if you prefer. Using the same whisky/water mix as above, swap in a hot chocolate K-Cup instead of the coffee. It will be tasty as is, but we recommend adding a couple marshmallows and one ounce of Peppermint Schnapps. It's like drinking a hot, boozy Girl Scout cookie. Or you can sub in a black tea K-Cup for making hot toddies (though we prefer our hot toddies with brandy, so you might as well make that substitution, too). Once brewed, add the juice of a 1/4 of a lemon, a few cloves if you've got 'em, and honey to taste. An odd, but rather delightful one we tried is something we call the Gin Zinger. Use a lemon zinger K-Cup and substitute a dry-ish gin for whiskey (we used Gordon's), retaining the 2:1 water to spirit ratio. Then add a little honey to taste. It's surprisingly refreshing. We recommend it with raspberry zinger tea, too. So, are K-Cup drinks that much of an improvement? Is it worth risking burning down your house (or at least ruining a Keurig machine) in order to achieve these bold new flavors. In a word, no. Don't get us wrong, all of the above drinks we made were tasty, but it's nothing you couldn't achieve through easier, safer methods. For example, if you wanted a stronger Irish coffee, use more grounds when you brew. If you want a stronger flavored toddy, let the tea steep longer. If you want chocolatier hot chocolate, use more chocolate. That said, we regret nothing. We managed to avoid setting anything on fire, and the K-Cup machine seems to have survived (for now). More to the point, we answered a question that's been bugging us for years, and isn't that really the point of science? Let's go with yes. Anyway, it's finally warm outside, which means that if you're want a new and improved breakfast beverage, check out our recipes for green snappers. Or, if you want something to really blow your mind, check out our original recipe for Cold-Brew Irish Coffee. We'll be back next week, with more Happy Hour.